Farhan’s paper on a “nano yoyo” for low tension gauge tethers to define single molecular forces required for Notch activation is published in Nano Letters. Notch signaling, involved in development and tissue homeostasis, is activated at the cell–cell interface through ligand–receptor interactions. Previous studies have implicated mechanical forces in the activation of Notch receptor upon binding to its ligand. Here we aimed to determine the single molecular force required for Notch activation by developing a novel low tension gauge tether (LTGT). 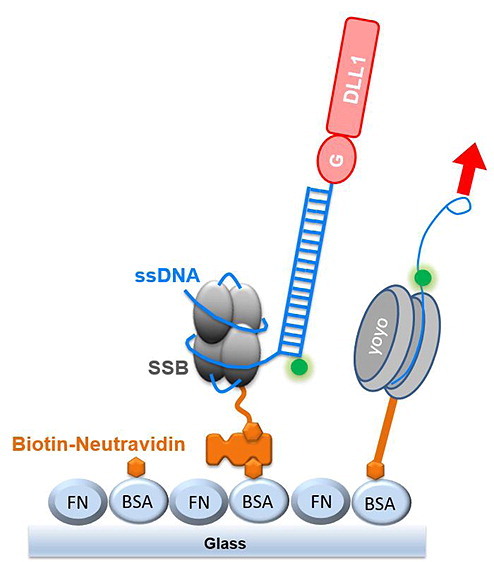 LTGT utilizes the low unbinding force between single-stranded DNA (ssDNA) andEscherichia coli ssDNA binding protein (SSB) (∼4 pN dissociation force at 500 nm/s pulling rate). The ssDNA wraps around SSB and, upon application of force, unspools from SSB, much like the unspooling of a yoyo. One end of this nano yoyo is attached to the surface though SSB, while the other end presents a ligand. A Notch receptor, upon binding to its ligand, is believed to undergo force-induced conformational changes required for activating downstream signaling. If the required force for such activation is larger than 4 pN, ssDNA will unspool from SSB, and downstream signaling will not be activated. Using these LTGTs, in combination with the previously reported TGTs that rupture double-stranded DNA at defined forces, we demonstrate that Notch activation requires forces between 4 and 12 pN, assuming an in vivo loading rate of 60 pN/s. Taken together, our study provides a direct link between single-molecular forces and Notch activation.